We highly recommend this bird feeder to anyone who loves feathered friends as much as we do. 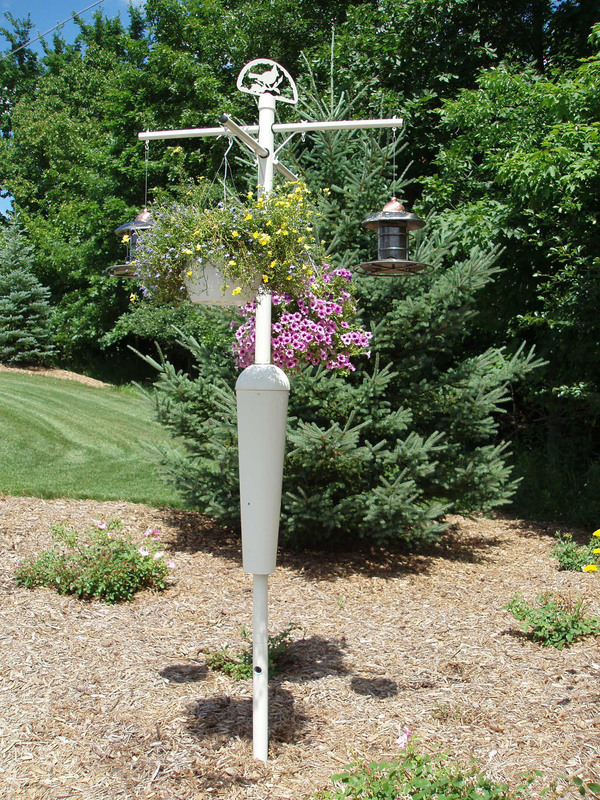 It is very attractive, and allows one to hang several feeders on one pole. A huge plus is how it prohibits pesky squirrels from climbing the pole to eat from the feeders. I am very pleased with my Squirrel Stopper in white. It is is decorative as I have hung two hanging plants on it, two bird feeders, a small water container and a hanging bird bath. The birds love it and the squirrels cannot get up on it at all. So, I am thrilled. I was so happy to find it in white in particular for this tree design. It does exactly what it claims to do! It takes the birds a couple weeks to get used to it but once they do they're all over it. It ended all the squirrel problems and we see lots more birds and lots less squirrels. Not only does the pole look good in my backyard, it so far has deterred the "critters". Now if bear just don't come strolling by, I'm very pleased. We've had this up 5 weeks now and it works beautifully. If it continues to work I would give it 5 stars. My only reservation is the squirrel stopper has some moving parts but if they continue working threw the year - definitely 5 stars. Very sturdy, well constructed, easy to set up, although if you have very rocky soil like ours you will have to dig a deep hole.